The potential shift was reported to Twitter on Wednesday by The Information's Amir Efrati, who said Apple's move to Google Cloud could take a year and, like the current Apple tie up with Amazon Web Services, is unlikely to be a money maker for the Internet search giant. Alongside its own iCloud data centers, Apple relies on key third-party providers in servicing a worldwide customer base of more than 782 million users. A report from CRN earlier in the day cited sources as saying Apple recently signed on with Google ahead of its departure from AWS in a deal worth $400 million to $600 million. Lending credence to Efrati's report are backend changes to the way OS X Messages handles attachments. 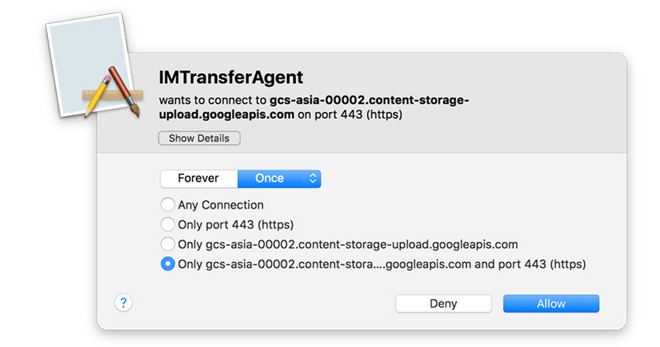 AppleInsider discovered Mac's IMTransferAgent routing certain outbound data requests through Google's servers in Asia, as seen in the screenshot above. "It's kind of a puzzler to us because vendors who understand doing business with enterprises respect NDAs with their customers and don't imply competitive defection where it doesn't exist," an AWS spokesperson told AppleInsider. Earlier this year, industry watchers predicted Apple to draw down its reliance on AWS in favor of an in-house solution, speculating the move would take about two years to complete. During a recent investor conference call, Apple CFO Luca Maestri stressed the importance of fiscally responsible data center operations in light of a quickly expanding iCloud user base. "Then we've got data centers," Maestri said. "And data centers is a growing expenditure for us, because as we mentioned in our prepared remarks, our install base of customers and devices is growing, and it's growing very significantly. And the data center capacity that we put in place is to provide the services that are tied to the install base." While mere speculation, Apple could be looking for temporary solution as it weens off AWS. The company currently has plans to build three data centers scheduled to open over the next two years, including a $2 billion "global command center" located at the failed sapphire production plant in Mesa, Ariz. Two more facilities are slated to open in Ireland and Denmark for European customers. Update: A report from CRN claims Apple has already inked a deal with Google worth $400 million to $600 million. Update 2: Article updated with response from Amazon.